John W. Backus, the IBM computer scientist who developed the FORTRAN programming language in the 1950s, died at age 82 March 17 in Ashland, OR. FORTRAN was the first successful high-level programming language. 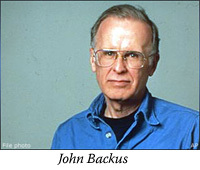 Backus received a BS in mathematics from Columbia University's School of General Studies in 1949. He worked at IBM Watson Lab at Columbia University from 1950 to 1952 and went on to lead IBM's Programming Research Group. "Much of my work has come from being lazy," Backus told Think, the IBM employee magazine, in 1979. "I didn't like writing programs, and so, when I was working on the IBM 701 [an early computer], writing programs for computing missile trajectories, I started work on a programming system to make it easier to write programs."